Here at the museum, there’s always something to keep us busy. If we aren’t taking people through one of our historic buildings or helping researchers look up records in our archives we’re always finding something that needs doing! One of the projects that has been ongoing here at the museum is digitizing our collections. For the most part, this is done as we re-inventory; we record an item and its location, take a picture of it, and then enter both into our museum management computer program. (See our more detailed post about our inventorying effort here). But, not all of the museum’s collections are 3D artifacts and so aren’t included in our efforts to re-inventory. The Dearborn Historical Museum boasts an extensive archives in the McFadden-Ross House. Currently, our archives serves the Dearborn community by facilitating research and providing a historic look at Dearborn and its people. One of our goals for digitizing our collections, including the archives, is making it easier for people to access them. The viability of a small museum is tied to how well it makes itself available to the public. Updating our digital records is just the first step. The next step is getting it available for viewing for members over the internet. It would be so fantastic to be able to share so much of our collection with people so easily and to be able to share our history with a much wider audience. Updating the museum is not just confined to digitizing our collections. It also means making sure we are providing programs and exhibits that are interesting and informative to everyone; from children to adults, Dearborn residents to out-of-towners. To address this incentive, the museum has been working on many new and exciting events. In this year alone, the museum has added many events and even brought back popular ones. The most exciting of these events is the Dearborn Historical Museum’s First Annual Beer Tasting! The Beer Tasting will feature Michigan brewery Kuhnhenn with select beers and wines and Detroit BBQ for all kinds of delicious food. Visitors will be able to try all kinds of great beer, wine, root beer (for the kids or those who don’t drink) and food and listen to a live band. We’re hoping this event is a popular one and will be around for years to come! Through these efforts, the museum is increasing its visibility and its accessibility. It’s so exciting to be here during this time. Our history is meeting our present technology to propel us into the future! This last week, people have been commemorating the 150th anniversary of the Civil War and the battle at Gettysburg. The Civil War impacted every state in one way or another, and Michigan is no different. Dearborn has a unique place in this history as home to a United States Arsenal. To help commemorate the 150th anniversary of the Civil War, we have put together a history of the Detroit Arsenal in Dearbornville and its service during the Civil War. Not much remains of the United States Arsenal that was built in Dearbornville in the 1830s. When completed, the arsenal consisted of eleven buildings: the armory, sutler’s shop (where personal items could be purchased), guard house, the barracks, surgeon’s quarters, carpenter’s shop, smith’s shop, saddler’s shop, gun-carriage shed, the arsenal office, and the commandant’s quarters. The powder magazine, with its two foot thick brick walls, wasn’t completed until 1839 and was located safely outside of the arsenal walls. The Detroit Arsenal at Dearbornville was smaller than similar arsenals such as those at Springfield, Waterviet, and St. Louis. This is because, unlike bigger operations, the Detroit Arsenal at Dearbornville never manufactured weapons. Instead, the Arsenal staff repaired weapons and other military material. The Arsenal wasn’t an army base; very few soldiers ever trained here. The Arsenal served as an armory where various companies would stop to procure arms before marching off to battle. The Arsenal became an important stop for Michigan troops on their way to fight in the American Civil War. Due to the need for more soldiers at the front, many arsenals operated with skeleton crews and had only enough men to perform the most essential tasks. The Arsenal at Dearbornville is no exception. In 1864, there were only eight soldiers stationed full-time at the arsenal. If required, these eight men would be charged with handing out weapons and gear for hundreds of soldiers. Depriving the Arsenal of guards created other problems. Due to the draft, support of the government was down and an attack on a poorly manned arsenal was a very real possibility. To fix this problem, General Order 69 was expanded. This allowed “invalids” or persons who were in part disabled either through natural causes or war to serve in non-front line duties. On August 20, 1864, Cpt. George C. Davenport and Company F of the 2nd Regiment, Veteran Corps joined the small number still stationed at the Arsenal in Dearbornville. This increased the number of soldiers by a factor of almost 100. Just a day after the Union victory at Gettysburg, a large celebration was held. Nearly 5,000 people gathered at the Arsenal parade grounds for a day of festivities. The Declaration of Independence was read by Cpt. Levan C. Rhines of the 1st Michigan Sharpshooters and Col. Charles V. DeLand, also of the Sharpshooters, made a short speech. Records show that the day of the celebration was so hot, thirty barrels of ice water was consumed within fifteen minutes. At the end of the Civil War, the Arsenal was charged with re-collecting United States Property from soldiers returning home. The Arsenal collected arms from the First, Second, Fourth, Seventh, Eighth, Tenth, Eleventh, Thirteenth, Fourteenth, Sixteenth, Seventeenth, Eighteenth, Nineteenth, Twentieth, Twenty-first, Twenty-second, Twenty-third, Twenty-Fourth, Twenty-Fifth, Twenty-sixth, Twenty-seventh Regiments, the First Michigan Sharpshooters, and the Fourth Calvary. served as training facilities for Michigan soldiers. The last weekend of June saw the return of the Teddy Bear Picnic after a seven-year absence. We had a great turn out and are already planning new and better things for next year! 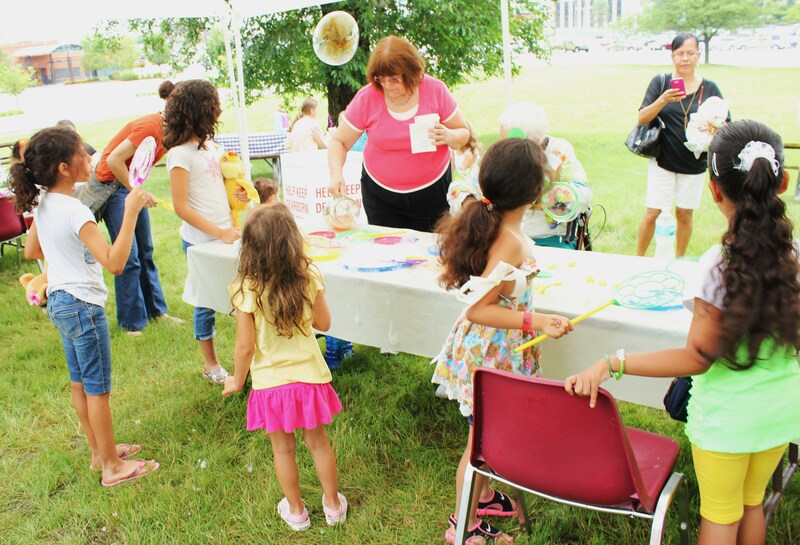 The Teddy Bear Picnic had been a Dearborn historical Museum tradition but the museum wasn’t able to put on the event for over half a decade. Thanks to the help of the Dearborn Historical Society and volunteers the Teddy Bear picnic is back! 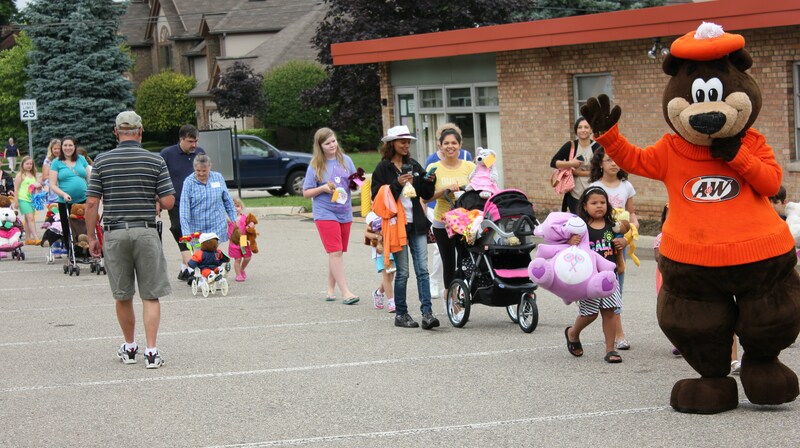 The picnic featured games, contests, and a Teddy Bear Parade (led by Rooty, the A&W bear himself!) for families to enjoy. It was exciting to see a favorite museum event return to such enthusiasm. Over 100 people showed up for the return of the Teddy Bear Picnic. With such a great turn out, the museum is already doing our best to think up more games and prizes for next year’s picnic. This is an event that we at the Dearborn Historical Museum want to keep growing for a long time. A&W helped sponsor the Teddy Bear Picnic, providing free root beer, and temporary tattoos for families and volunteers. Their contribution really can’t be downplayed. A&W even got Rooty to show up and lead the Teddy Bear Parade! We had so much fun at the Teddy Bear Picnic and hope you did too! See you there next year!